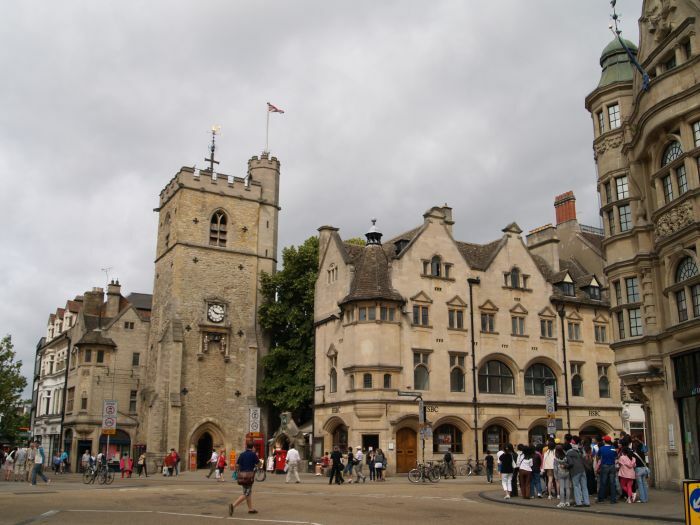 Carfax is at the junction of St Aldate’s (south), Cornmarket Street (north), Queen Street (west) and the High Street (east) in Oxford, England. It is considered to be the centre of the city, and is at The name “Carfax” derives from the Latin “quadrifurcus” via the French “carrefour”, both of which mean “crossroads”. St Martin’s Tower, popularly called “Carfax Tower”, is on the northwest corner of Carfax. It is all that remains of the 12th-century St Martin’s Church and is now owned by the Oxford City Council. It was the official City Church of Oxford, where the Mayor and Corporation were expected to worship, between about 1122 and 1896, when the main part of the church was demolished to make more room for road traffic. In 1896 the City Church was moved to All Saints Church in the High Street. The tower is 74 feet (23 m) tall, and no building in central Oxford may be built higher than it. It is a Grade II* listed building. The tower still has a ring of six bells: five recast from the original ring by Richard Keene of Woodstock in 1676, plus another cast by Keene two years later. They are rung on special occasions by the Oxford Society of Change Ringers. There is also a clock that chimes the quarter hours on a pair of bells cast by John Taylor & Co of Loughborough in 1898. The clock’s current dial and surroundings were designed by Sir TG Jackson and installed in 1898. In 1938–39 the clock mechanism was replaced with an electric one made by Gents’ of Leicester. It is possible to climb to the top of the tower for a view of the Oxford skyline. The tower is open 10am–5.30pm Easter to October, and 10am–3.30pm October to Easter. Blenheim Palace (pronounced /ˈblɛnɪm/ blen-im) is a monumental country house situated in Woodstock, Oxfordshire, England. It is the principal residence of the dukes of Marlborough, and the only non-royal non-episcopal country house in England to hold the title of palace. The palace, one of England’s largest houses, was built between 1705 and circa 1722. 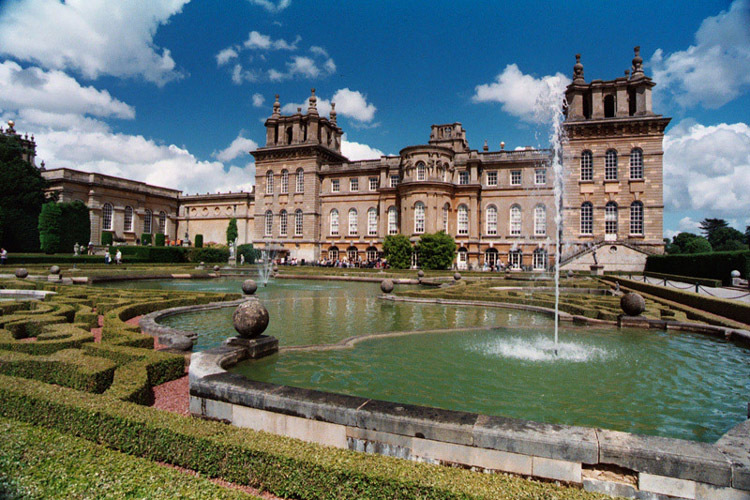 Blenheim Palace was designated a UNESCO World Heritage Site in 1987. Following the palace’s completion, it became the home of the Churchill, later Spencer-Churchill, family for the next 300 years, and various members of the family have in that period wrought changes, in the interiors, park and gardens. At the end of the 19th century, the palace was saved from ruin by funds gained from the 9th Duke of Marlborough‘s marriage to American railroad heiressConsuelo Vanderbilt. The exterior of the palace remains in good repair. I got my degree in engineering because my brother was going to school for that and I couldn’t think of any other career paths that I wanted to do. After graduating college and securing a job at Westinghouse I was excited and ready to start my career. I soon realized that I had made the wrong choice and that it wasn’t what I thought it would be. The people I worked with seemed lifeless and passionless about their jobs and the feeling was contagious. There always seemed to be an air of tension among people and the way they acted seemed fake and somewhat nervous. My first goal was to simplify my life so I didn’t need all of this income to exist. I sold my expensive sports car, moved into a smaller place, stopped going out so much, and focused on getting rid of anything that wasn’t mandatory. I started my own painting company on the side and was able to leave the corporate world for good within a year. After a few years even this kind of freedom wasn’t enough, something was missing. All throughout my life friends would tell me I was funny and I should be a comedian. I finally took this to heart and tried a comedy course at a local comedy club. Well, that was over a decade ago and I am more passionate than ever about this career in the performing arts. It has opened my eyes to a new way of looking at life and reignited my spirit. You must find that calling that you were meant to do and go for it regardless of the pay. If you get good at anything there will always be a sector of people who are willing to pay it. This way you won’t be counting down the years left in your career, but counting up the years that you’ve been doing it and hoping for more. There is no retirement for me, I’ll do this till the day I die. There is more to life than just getting by. Things don’t make us happy, they may be exciting at first but once the thrill wears off you are just left with bills in the mail causing even more stress than before. If you minimize and simplify your life one step at a time you will create more freedom and free time to do the things that you enjoy. Money does not equal happiness, it is more just a tool to help you get the things you need. Don’t just buy things that you want, it is a never ending cycle. There is always another gadget to buy, another subscription to join, only causing you to fall further in debt and making it so you have to work more. When I was a little kid I had food to eat, a place to sleep, and transportation to get around and I didn’t need to work 40 or more hours a week to have this. My goal is to have that freedom back that I had when I was a little kid and it is possible to do. It doesn’t take much to make you happy if you are doing what you love, that itself is fulfilling enough. Think of the things you need to feel better; exercise, sunshine, silence, passion, love. Most of these things are either free or very inexpensive to have, make it a point to get more of what you need and you won’t want anything more. They say if you want to be happy focus all of your attention on making other people happy, and if you want to be miserable focus only on making yourself happy. We like to think we are independent but, in fact, we are interdependent beings. If I put you on a desert island with nothing but your computer and Facebook “friends” you would end up being extremely lonely and very unhappy over time, we need each other. Compassion, or concern for others, helps to humanize us and connect us making us feel like we are part of something bigger and, in return, making us feel better about ourselves and happier in the process. Just start in small ways to care about others, it doesn’t happen overnight. You can train your mind to become anything you want, it just happens slowly over time. Set your intention to be a more compassionate and caring person and as time goes by you will become just that and end up a much happier person than when you began. You may be going to bed at night wondering why people at your job or school aren’t your friends. Well, you’re in luck my friend because I had no issues gaining friends and you’re about to be coached. I can help you get people to like you more. What is this buzz about popularity anyway? Why does it matter so much? Let’s face it, it’s just no fun being at home on a Saturday night staring at the four walls – unless you choose to that is. Don’t get me wrong, some weekends you’ll want to have “boo loving” sessions with your other half, watching a movie or just staying in and reading a book. However, since you are reading this article that is not really your intention at the moment. Now, get comfortable and let the guru of friends making teach you a thing or two… or seven. Your confidence is important. You may be a simple house-cat, but what’s so wrong with viewing yourself as a beautifully striped tiger. It’s crazy how the way you view yourself is how people will react to you… well most of them. Some people literally start off their days trying to be a more awesome a**hole than they already are. Don’t settle for that, and don’t dwell on what those people say. You don’t even have to acknowledge their existence. You’re better than that. Create such an aura to yourself that when you step out of your house, you don’t remember to care about negativity. How do you get to this? Good question. That leads me to number two. Compliment yourself before you leave the bathroom in the morning. You have to convince yourself before you can try it somewhere else. This worked out well for me during high school, college, and even now. You may not have it all together but people on the outside don’t need to know that. Stop moping around and let them feel as if you are stronger than your situation. Soon after, you’ll start believing it too. When you believe in this, you become it. Also, when you compliment yourself it’s so powerful that people will have a difficult time trying to put you down. If you compliment yourself as part of your daily routine, people can put you down but it won’t sink in as well as your morning message does. Push through the hurt and stick to it. I’m not saying you won’t doubt yourself with all that’s going on but push through it; you have to promulgate an effort. Hygiene is important. It’s a known fact that when you smell good you feel good. Taking a shower, brushing your teeth, flossing, wearing clean clothes, and using a decent amount of cologne or perfume (please don’t overdo it) will do wonders for you. You’ll be walking somewhere and people will look at you and say “Nice Outfit!” or “You smell amazing!” This will bring one of the greatest feelings on Earth. After all, we are just humans and we love to feel good. What do you know? Those same compliments are opportunities for striking up a conversation which could lead to great friendships. Anything is possible. For Heaven’s sake would you smile more? Smiles are universal. No matter where you go they mean the same thing. I read an article when I was about 15 that said even faking a smile will release those happy hormones (endorphins). Do you know what that means? Those are the same hormones your body releases when you genuinely smile or laugh. Let that sink in. Your body gives the same reaction for any type of smile – genuine or not. Try this out with strangers. At 23 years old, I am the queen of smiling, and I’m still a people person. What does that tell you? It means that a smile can go a long way. Plus, if it worked for me, it will work for you too. We are no different. Be open to have fun! Join a club with something that you like or something that you’re good at. I have loved music since I knew myself so it led me to joining the school choir. Up until now, I still have friends who are making music that I met from the choir. Now, would you look at that? You get to meet people and share common ground with them. Have you ever heard about the law of attraction? If not, it states that like attracts like. Therefore, if you are in a place with people who like the same things you like, they are bound to like you more. If you haven’t found something you like yet, that’s fine too. All hope is not gone! You can either start your own group or suggest something fun to someone. Be random, be courageous, and be consistent. Before you do this, make sure that person is already in your circle of friends. Just to be safe, that means not a complete stranger. You are not a shadow or a bean bag, so don’t settle for people trying to steal your shine or sit on you. You have needs, but don’t turn your needs and wants to desperation. THAT’S A DEAD END! Keep trying until you get the results you want. Better yet, don’t be afraid to reach out to me. I care deeply about people and who they view themselves as. I appreciate you and you should appreciate yourself too. Expect that people will like you for you. If it doesn’t happen immediately, keep expecting. You should wake up in the mornings, go throughout the day, and go to bed expecting. I cannot stress it enough. It can be overbearing at times, and you will face disappointments, but that’s life. We shall move pass that. Everything needs balance. Without bad, we wouldn’t know what is good, so keep keeping on and expect more for yourself.